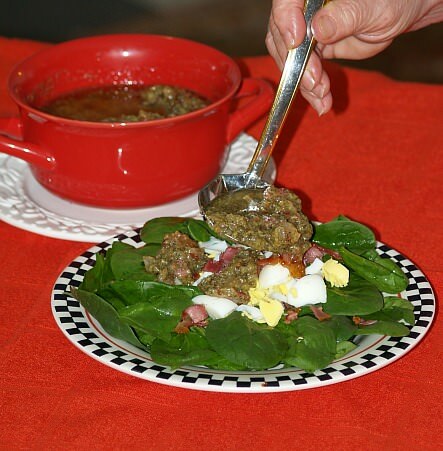 When I learned how to make a bacon salad dressing I found that it can be used on many salads and dishes. To me spinach salad is not complete without bacon dressing. If you are learning how to make salad dressing, the bacon and spinach makes a perfect combination; add a chopped boiled egg and a few slices of fresh tomato and you have a delicious spinach salad recipe. When I learned how to make a bacon salad dressing I found it was good added to most other fresh greens, green beans, cabbage and potatoes. The following is my favorite for a spinach salad. I also include this recipe in my crowd size recipes when I am cooking for a crowd. It can be made ahead and kept warm and then it is quick and easy to add to a fresh bowl of spinach the last minute. The following bacon dressing is also good served on vegetables. If you are learning how to make salad dressing you will find some are better serve freshly made and hot while others are better made in advance and refrigerated. This recipe should be made in advance. Cook bacon until crisp, crumble and set aside. Add the onions to the bacon drippings and sauté until tender. Combine in a saucepan the onions, beaten egg yolks, salt , pepper, dry mustard, sugar, vinegar, Worcestershire sauce, dill and salad oil; Whisk until well blended. Set on medium heat and cook until sugar has dissolved and mixture thickens, whisking constantly. When mixture has finished cooking, stir in the crumbled bacon and serve hot. Store in refrigerator and reheat to serve. Cook bacon until crisp, remove from pan with slotted spoon and set aside. Add onion to the drippings and sauté until tender; add flour and cook for 2 minutes to form a roux and remove from heat. In a large saucepan, combine the water, vinegar, bouillon, sugar, salt and pepper; bring to a boil over medium heat Stir roux into the water vinegar mixture and stir until smooth; stir in the bacon. Serve on vegetables and potatoes. Store in refrigerator. NOTE: This recipe is very good and easy to multiply when I am serving a crowd; I usually make about 10 cups by using the second list of measurements. Wash greens and dry thoroughly; refrigerate until ready to serve. After cooking bacon in skillet, remove bacon and drain on paper towels. Remove all but 2 tablespoons of the bacon drippings. Add the onion to skillet; cook and stir until the onion is tender. In a small bowl combine cornstarch, broth, vinegar, sugar, salt and pepper; blend well. Add mixture to the skillet; cook and stir over medium heat until slightly thickened. Spoon hot mixture over salad greens; crumble bacon over the top and serve immediately.